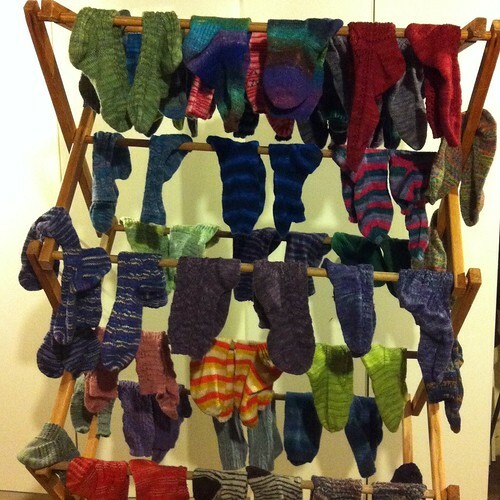 Last week was a whirlwind of socks! Thursday morning I woke bright (ok, actually dark) and early to get on a train to Portland and Sock Summit. To be truthful, I was waking at 5am after a 2 hour “nap”, since I stayed up til 3am packing and wondering where my summer clothes were once I heard it was going to be in the 80s in Portland. We haven’t had much summer this year. 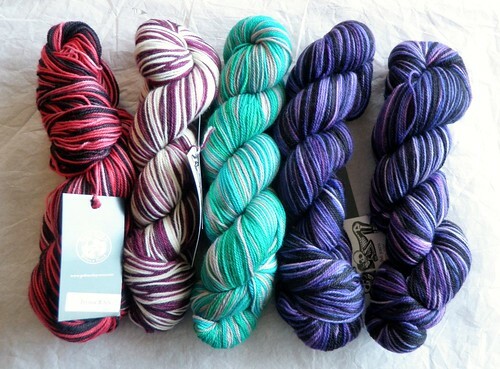 Then I met up with the lovely Stephania of Three Fates yarns to hand over my sock samples. I totally should have gotten a picture of them hanging in her booth, but alas I did not. 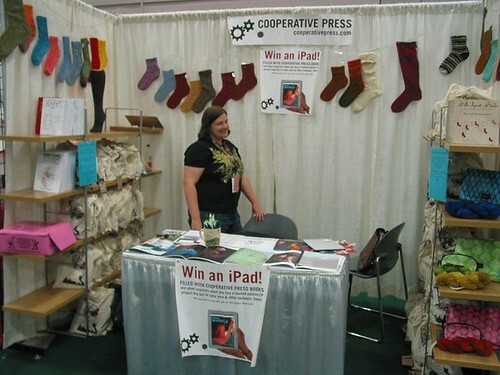 I helped Shannon set up at the Cooperative Press booth and had my first Voodoo Donut, scored a bit of Goth Socks when the market opened, and then went and sold CP grab bags until it closed again and we went to get dinner. Friday morning I had a class, then headed to the market place where I alternated between helping at the CP booth and wandering the marketplace while knitting the socks above. 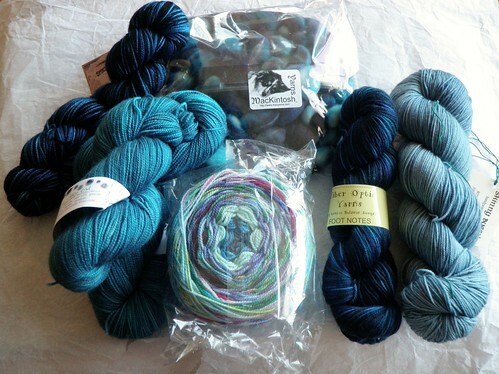 I bought a few more skeins of yarn too. Just before leaving, Cookie A took a picture of my Twisted Flower socks! 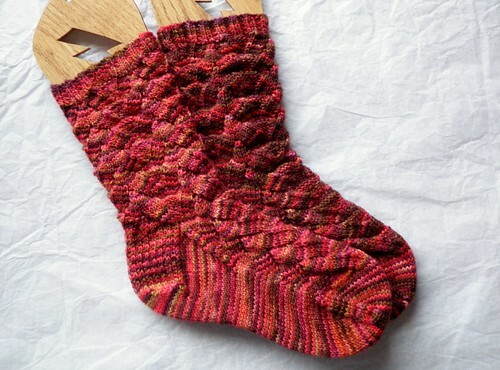 I was lucky enough to have dinner with some fun and fabulously knitty people, including Kate Atherley who designed the My Vampire Boyfriend socks which I am currently neglecting – but they’re awesome socks, and I’m totally going to finish them! – and Sarah from Sanguine Gryphon. Saturday was more marketplacing and booth-sitting, and dinner with a friend who was down for just the day, then early to bed. Sunday morning we could barely get out of bed – sometimes all the socky excitement is just too much! But we managed and headed into Sock Summit for one last fun-filled day. 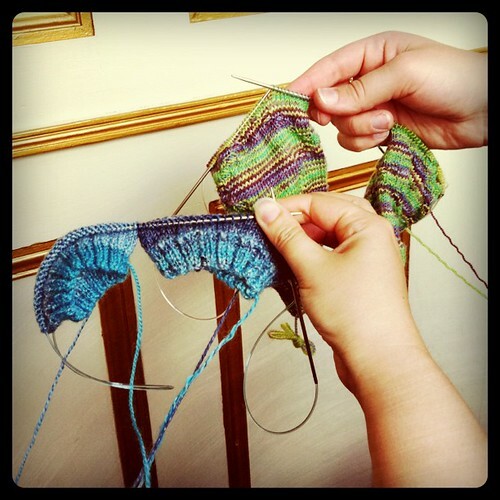 I skipped out for lunch and took the Max downtown with Lacey, where we knit socks… of course. Afterwards I had a low key dinner with Shannon and then she got a tattoo! I love accompanying people on their tattoo appointments! 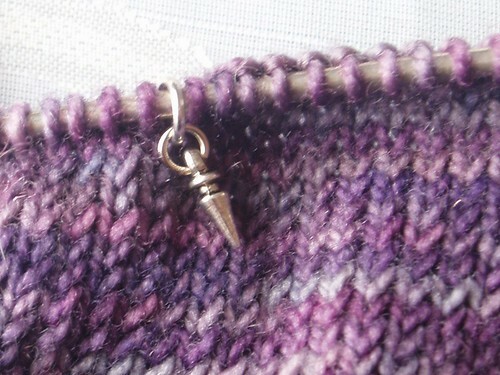 Then it was up even more early on Monday to head over to Knit Picks. 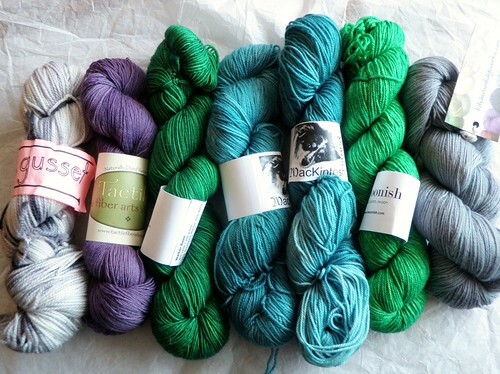 I saw fabulous new yarns, met Stacey who I had only corresponded with by email, and filmed some video. 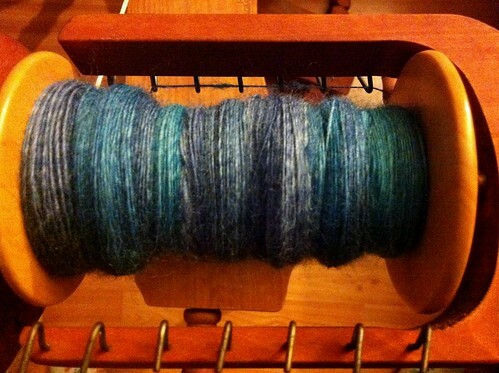 And the rest (including the yarn) will have to wait for later. Too much fun! 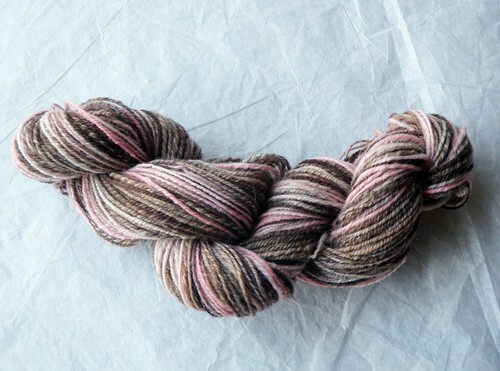 As some of you know, I’m not a big toe-up sock knitter. There are a few reasons for this. I’ve only found one toe-up heel that fits my feet well. One of the main benefits of knitting socks toe-up is not having to worry about running out of yarn, and I don’t usually have to worry about that anyway. 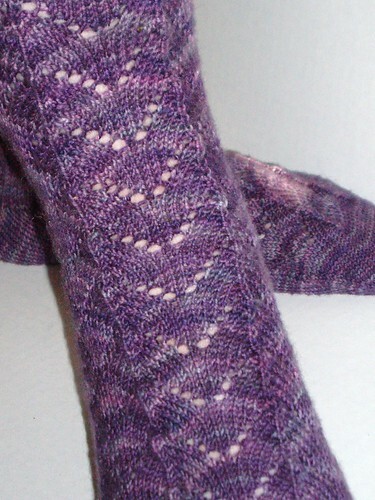 The gusset is my favorite part of the sock, and toe-up socks don’t usually have a gusset. 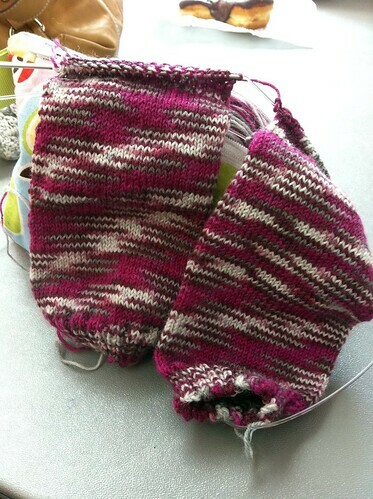 Sometimes I do knit socks toe up, but then I use a gusseted short row heel, which means more calculating when to start the increases on the foot to end up on the right pattern row to start the leg after the heel. In this case, cuff down is just easier. I have an extra signed copy of Chrissy Gardiner’s new book Toe-Up! 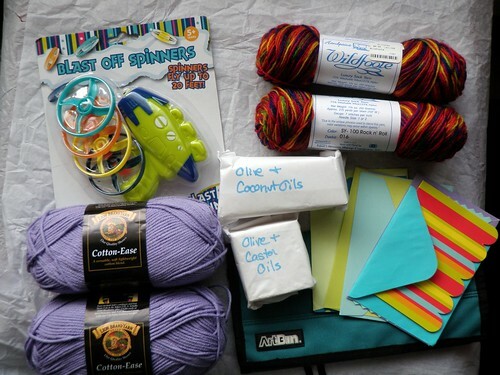 to give away! I helped proofread the book, and picked up two copies at Sock Summit – one for me and one for the lucky winner. 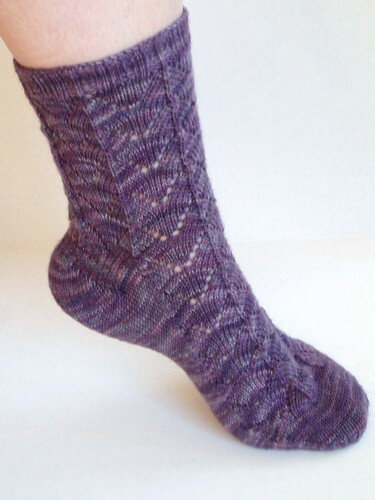 I’ll also throw in a PDF copy of my newest sock pattern – also knit toe-up – Falling Up. And, as a little bonus for the runner up, they get a copy of my pattern too. So, how do you win these fabulous prizes? 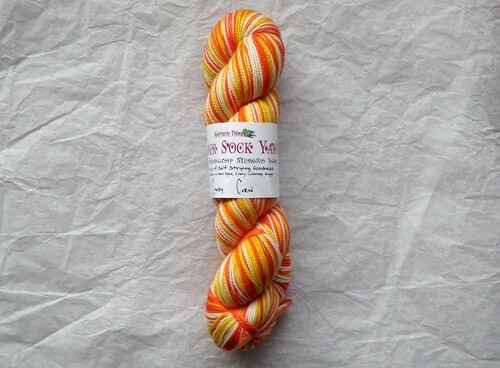 Well, just guess how many pairs worth of sock yarn I bought at Sock Summit. I’ll give you some time to contemplate – entries will close on August 25th. So it’s time to introduce Falling Up! It had to be knit toe-up. 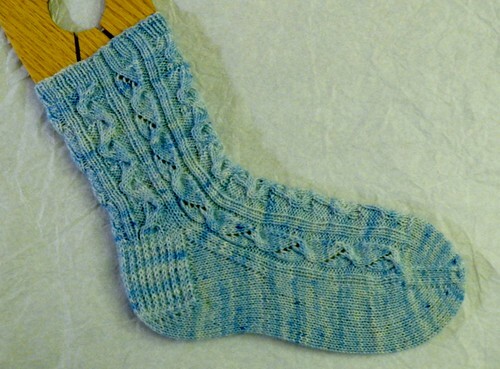 Now, it’s not that I dislike toe-up socks, it’s just that it’s hard to find a heel that fits me well. There’s one, and it’s the one I used in this sock. But doing a gusset in a toe up sock requires a lot more thinking and calculation to figure out when you need to start the increases to have your pattern line up with a certain row for the leg. 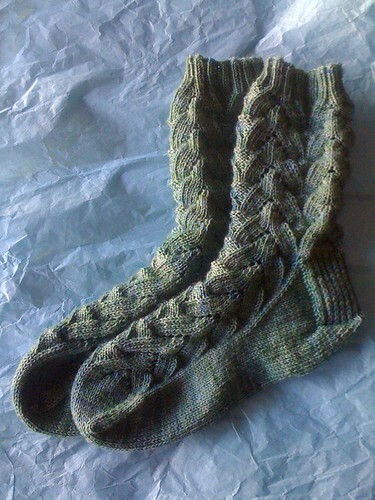 There’s the number of increases, which you use to find the number of rows, which you then plug into the pattern to figure out which pattern row you’ll end on… it’s much easier to just *end* on a certain row (like in a cuff-down sock). 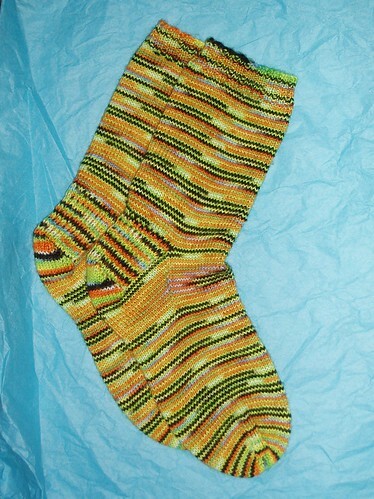 But I persevered, and came out with some lovely socks that have all that annoying stuff figured out for you already! 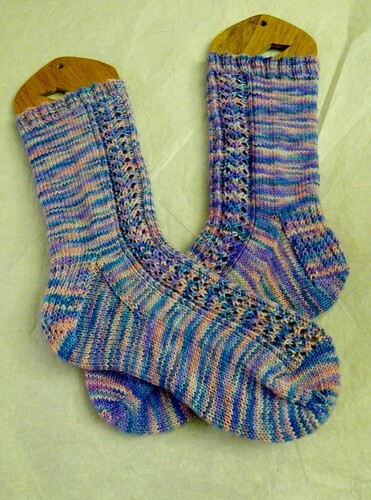 It will be making it’s in-person debut at the Knit A Bit booth #808 at Sock Summit, with a sample sock and Stephania’s beautiful yarns, but the pattern itself is up for sale on Ravelry right now.